Before my son was born, I started organizing and cleaning all my baby supplies. As I was washing baby bedding, I realized that I had never washed my pack n play. I had washed the sheets many, many times and had wiped down the metal and plastic parts, but I had never washed the pack n play itself. I began to picture all the blowout poops and spit-up incidents that had happened in the pack n play. After feeling slightly disgusted, I remembered seeing a picture of a pack n play in a bathtub, on Pinterest. I went back for instructions, but only found a picture. I decided to make my own concoction and see if it really worked. 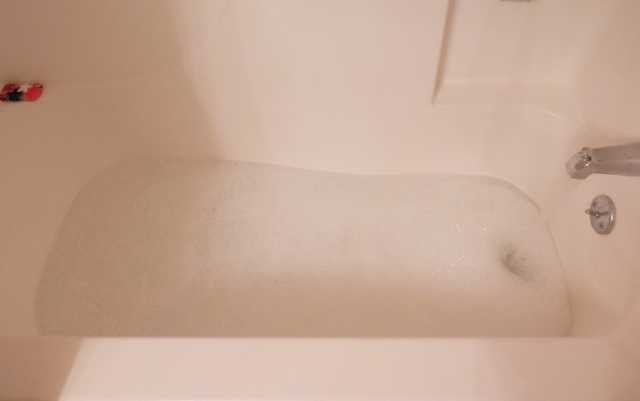 I began by filling my tub with very hot water. While the water was running, I added 1/2 C of laundry detergent, ¼ C of baking soda, and a couple of glugs of vinegar (maybe ⅛ C). I began by putting the pack n play “mattress” in the tub. It floated. So, I put the base of the pack n play on top of the mattress to hold it down. The water covered about half of the the pack n play, so after 45 minutes, I rotated the base. After rotating the base, I added additional hot water and swished everything around in the water. I left everything to soak for another hour. When I came back, the water was absolutely disgusting! 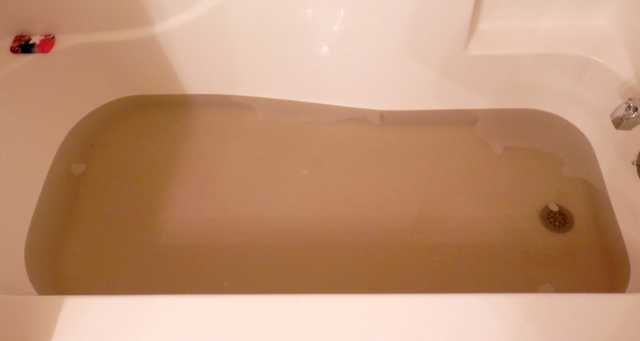 After draining the water, there was a thick layer of dirt and gunk on the bottom of my tub. GROSS! I rinsed the base and mattress off in the shower. I laid the mattress and base outside to dry. The base dried after about 4 hours. I let the mattress dry for 24 hours, just to be sure all the moisture was gone. The pack n play smelled clean and fresh and looked so much brighter. I can’t believe how filthy the pack n play had been, and I’m so glad I washed it before my baby slept in it. Firstly, please be sure to check the materials the pad is made with. If it feels like wood or cardboard, I suggest hand scrubbing with the solution without getting the pad too wet. My pack in play is a Graco, and it still turned out fine. I think the trick was lying it out flat until it was completely dry. That way the base of the mattress didn’t bow. I didn’t scrub, but I swished it around. I’m sure scrubbing with a rag or a soft bristled brush would be just fine. When I laid the mattress out, I laid it in the sun. It’s possible that the fact that it was very hot and in direct sunlight made the difference. Melissa said: Mine was super gross. Something spilled on it on a camping trip. It’s light blue. I didn’t scrub and it came right off. I was shocked. I swooshed it in the hot water but that was it. It looks brand new again. Elizabeth said: I soaked the pack and play in the tub as said and it cleaned up great! I was worried about the mattress molding because of previous comments so I didn’t soak it. Instead I ripped the seam and pulled the wooden slats out. Then I used safety pins to close the seam and washed it on hand wash setting in my washer. Then I dried it outside with the pack and play in the sun. After it was dry I put the slats back in and sewed it closed. It worked out great! The stains and smells were gone! When did you last clean your pack n play? If you like this post, please PIN it to Pinterest by hoovering your mouse over on the image below. I have a Graco pack’n play but I’m not sure if it has any cardboard in the mattress. Do you know if Gracos are safe or if there’s a way to find out if they’re safe to soak? My pack in play is a Graco, and it turned out fine. I think the trick was lying it out flat until it was completely dry. That way the base of the mattress didn’t bow. Did you scrub it at all? There are a few drool stains in mine and I’m not sure soaking alone will rid the mattress of them. Mine was super gross. Something spilled on it on a camping trip. It’s light blue. I didn’t scrub and it came right off. I was shocked. I swooshed it in the hot water but that was it. It looks brand new again. I just came across this post…. I am also wondering about the mattress having cardboard. My baby is such a sweaty betty, I am washing sheets & blankets all the time. But her mattress is still stinky, as soon as she’s up from a nap. Yuk!! Did you try this Katy? How did it come out? So even after pressing as much water out of the mattress as I could and hanging it to dry for a couple of days, it still molded. Is there some extra trick to preventing mold? When I laid the mattress out, I laid it in the sun, in July. I’m not sure if the fact that it was very hot and in direct sunlight made the difference. I’m really sorry that your mattress molded. I read on another blog that you should not soak the mattresses that have pressboard inside them because they will mold and/or warp. Someone cut theirs out and then sewed it back in to clean. Others spot cleaned with Biz. I think I am going to do the spot cleaning trick. Hi ! Thanks for post tips. I’m having problems with washing pack and play. Your article is great. So how did you get it dry? I don’t have a Graco, I have a Bright Starts and the bottom is made with wood – probably particle board, and sewn over with a foam layer and nylon fabric. I washed my pack n play today and the main part of it was super easy to soak, clean, and dry. 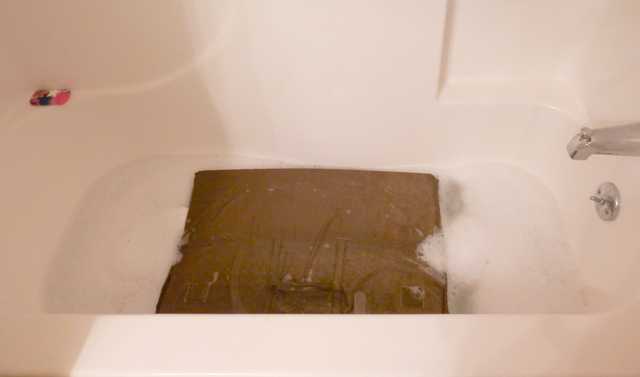 The bottom “mattress” part got a smell to it (not moldy – almost more chemical) and is still quite wet after sitting it upright in the empty bathtub all day and squeezing out the excess water. I think tonight I will lay it on the floor with a fan blowing on it – we live in a very humid area and even on Christmas Eve it’s been 79 degrees and 85 percent humidity – putting it outside would not help. I’m just posting this for anyone else who is trying to do this! I think what I should have done is wash the pack n play part in the tub like I did, then just wipe down the mattress as I have always done instead of soaking it. It sounds like it is risky regardless of what brand you have. Most pack and plays have a lightweight particle board for the mattress. Soaking it is a BAD idea! It will swell and even after it dries the glue holding the particles together will break down and it can either crack or completely disintegrate. I definitely recommend NOT soaking the mattress. The risk is splinters in your sweet baby’s skin… I use Lysol wipes and then just a wet washcloth to get the Lysol out of it. Lysol kills any bacteria from spit up of blowouts and also removes most stains. Ok, so I just did this and it worked great on the base. The mattress is another story. I soaked it for the prescribed time and rinsed it with the hose outside. However, when it dried, a ring of brown gunk appeared on he edges. So, I soaked and rinsed it again, TWO more times, these times pressing and squeezing the water out with my hands. Still, a nasty ring around the outside. Should I soak it some more? Try to rinse it better? It looks sooo gross and I don’t know what to do! I’m having the same problem. I did the soaking and drying of the whole pack and play and it turned out great, minus the water ring stain as it dried. I’m on attempt number two at getting this water stain out. I’ve dried it outside in hot weather both times. I dried it in a different position this time- washing the mattress again took out the previous water stain but now there’s a whole new one. I feel better knowing it’s cleaner but it definitely doesn’t look like it on the outside of the mattress. IMO : The problem is the cardboard. That is why your water looks dirty in the tub (not that some of that is from the playpen but most of that color is from the cardboard inside the mattress) and why you are getting a ring around the mattress. I washed a co-sleeper and had the same problem. I finally decided to make some slits and get the cardboard out and let it wash and dry separately before I put it back. I will not be submerging the mattress in the tub. Just use a bucket of hot soapy water and wipe/scrub with a rag. I loved your cleaning solution. You were right, the water is so gross after you soak it for a while. My travel size Graco pack n play is outside drying right now. I’m not sure how the mattress will turn out, but at least everything smells a lot better. Thank you for your post. Thanks for your comment. Glad the tips helped. How did the mattress turn out? I did this and came out well. When I put the pad out to dry,there is a stain on the end from the water draiing out. Should I rewash the pad or can I just spot clean it? This is a great idea. I just had one given to me used and I was wondering how I would clean it. May I make one suggestion. Many people mistakenly use vinegar and baking soda together as a cleaning agent but one is acidic and one is alkaline, so they cancel each other out. I plan to use a mild detergent along with oxyclean in very hot water for my soak. I soaked the pack and play in the tub as said and it cleaned up great! I was worried about the mattress molding because of previous comments so I didn’t soak it. Instead I ripped the seam and pulled the wooden slats out. Then I used safety pins to close the seam and washed it on hand wash setting in my washer. Then I dried it outside with the pack and play in the sun. After it was dry I put the slats back in and sewed it closed. It worked out great! The stains and smells were gone! that’s just what i was thinking!!!!!! PERFECT! Thanks for confirmation! headed to clean the used one i bought for my grandbaby!!!!!!!!!!!!!! I bought a used playpen today to use on a trip this weekend. It was cheap and said in the ad it needed cleaned. I had no idea how bad it was until I got it home. There was so much spit up on the mattress part that I couldn’t believe someone had been using it! It was absolutely disgusting!! So I checked Pinterest for the best ways to clean them and came across this. It sounded easy enough so I did it. I had to do two soaks, but it looks sooooo much better!! The smell is even gone! I did have to use my hose and spray out the bottom because some of the old crusty spit up just didn’t come out. However I’m happy to report that it is now clean enough I feel comfortable letting my nephew sleep in it this weekend!! Thank you!! sound so amazing. The thought of letting go of so many germs is great. But now how will this dry? Air dry? or with the blow dryer maybe? Wow! How disgusting!!! I am cleaning my pack and play today. Thank you so much for this information. My mattress also is now ruined from doing this. It soaked up water (dirty water) and soap, but it could not be rinsed out because of the waterproof covering. My husband and I both tried for a very long time to squeeze the dirty water out and it was impossible It dried with a huge brown ring around the edges of the top of the mattress. Its pretty disgusting. I recognize that it is mostly my fault, as I did not do much research nor read the comments of your post. But, after this happened I came back and read them and there are a few that state this same thing happening, or another cause of the mattress being ruined. I would suggest that you put a little update/disclaimer in your post so that this stops happening to people who are taking your advice. Most people, especially busy moms, don’t always have the time to read every comment on every advice/tip article they read. So if you do really want to help out other parents, I suggest the update/disclaimer that many pack n’ play mattresses should not be soaked. Thanks. Mine is ruined too! I figure the brown gunk in her tub was the mdf dissolving… I cut the seam out of mine and am attempting to cut new mdf. Maybe it will work! I do this all the time, but I do not rinse out the mattresses, I drain the tub and quickly run the mattress and the pack n play outside. I put the mattress on the hood of my car and let the sun dry it and I set up the pack n play in the sun. I let it set overnight then the next day I check it and flip it to dry the other side and flip the pack n play so it can drain water out from other angles. Putting the mattress on the hood of my car keeps it elevated enough so all the water goes to the bottom edge to drain and usually the brown around that edge, too, disappears. Thanks for the tip!! I just cleaned mine because I’m Having baby #2, water came out gross just like in your picture, it’s crazy to think my first baby kept using it being that dirty. But it’s all good now, it looks like new! Mine is a graco too.. And it’s in the drying process right now. Thanks! I’ve done this many times, I don’t measure anything out, I just pour until it seems good, but I leave mine for hours, sometimes overnight and fill with more hot water if it goes cold. The longer you leave it, the nastier the water so i feel like it cleans it more. We have 2 girls and 3 pack n plays so I try to rotate them out as often as I can, cleaning the extra then switching to clean another. I absolutely love this. I would probably remove the cover from the mattress base, and after washing, modify it so that it’s easy to remove for future washings. Thank you! As a grandmother too many little ones, I’ve just purchased a second hand Pack-n-Play. While it looks clean, my OCD tendencies had me wondering whether to hose it down, spray it with chemicals that I would prefer not to use and then hose it down, or take a scrub brush to it. This looks like the perfect solution. Now I know when my babies visit, they’ll be in a nice clean Pack-n-Play! 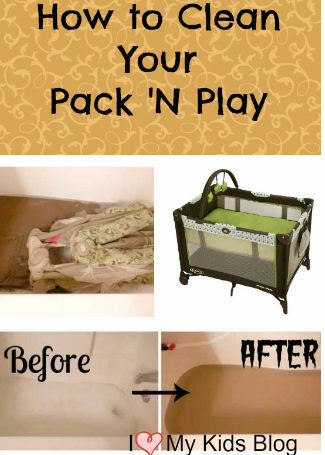 Do not soak your pack and play mat because it contains a board which deforms when soaked. Not to mention, very hard to dry. The color on the bathub shown on the picture above is not dirt but the color of the board. I recommend that you take out all the boards first, wash the foam and cover then put the boards back in and sew it. A baby’s very sensitive and you could not afford to have an unclean and moldy mat for him/her. Thanks for this blog. I didn’t think about this method and was considering buying a new pack n play. I’m going to try it now! Could the brown water be from the backing board of the pad? Did your pack in play have the hard wood in it? If so how did that fair with the water? The water doesnt ruin the partical type board that is used for the bottom base? What is the inside of the base/mattress made of? I just bought a used one and I definitely want to clean it. Yuck. I hope this works for me. 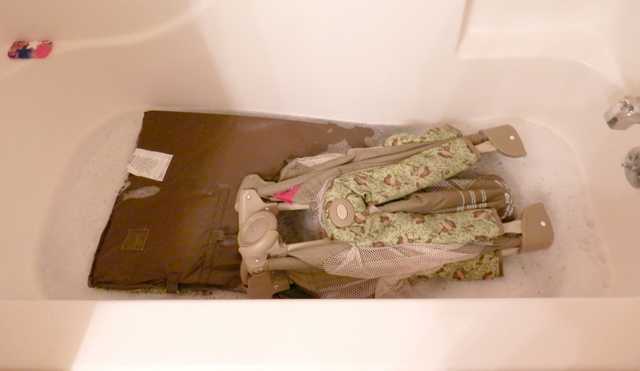 I have tried to clean my pack n play by immersing it in the bathtub, but when it dries it has major dirt looking stains on it. On the reverse side it has black dots on it. I’m at a loss of what to do, I would like to figure out the best way to clean it for my son to use. The mattress was ok, and usable afterwards, i have a graco and am sacred the mattress will desintegrate (the board) with water. HI Victoria, please be sure to check the materials the pad is made with. If it feels like wood or cardboard, I suggest hand scrubbing with the solution without getting the pad too wet. I just bought a pack n play for my newest grand baby from a consignment shop. I’ve read how to clean it but I’m concerned about the mattress pad it feels like some type of wood and not sure about wetting it. It is a graco brand with the thin pad. Will appreciate input. Hi Teresa, please be sure to check the materials the pad is made with. If it feels like wood or cardboard, I suggest hand scrubbing with the solution without getting the pad too wet.